A team from the University of Birmingham recently announced an astronomical discovery in Scotland marking the beginnings of recorded time. Announced last month in the Journal of Internet Archaeology, the Mesolithic monument consists of a series of pits near Aberdeenshire, Scotland. Estimated to date from 8,000 B.C., this 10,000 year old structure would pre-date calendars discovered in the Fertile Crescent region of the Middle East by over 5,000 years. But this is no ordinary wall calendar. Originally unearthed by the National Trust for Scotland in 2004, the site is designated as Warren Field near the town of Crathes. It consists of 12 pits in an arc 54 metres long that seem to correspond with 12 lunar months, plus an added correction to bring the calendar back into sync with the solar year on the date of the winter solstice. 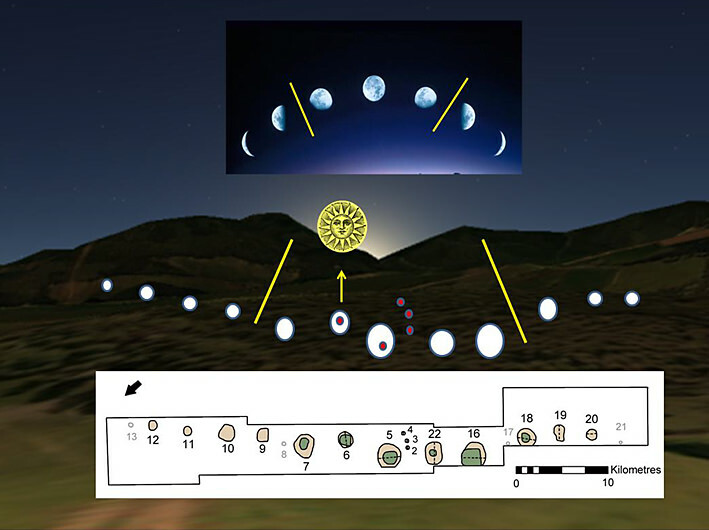 A diagram of the Warren Field site, showing the 12 pits (below) and the alignment with the phases of the Moon plus the rising of the winter solstice Sun. Note: the scale should read “0-10 metres.” (Credit: The University of Birmingham). “The evidence suggests that hunter-gatherer societies in Scotland had both the need and sophistication to track time across the years, to correct for seasonal drift of the lunar year” said team leader and professor of Landscape Archaeology at the University of Birmingham Vince Gaffney. We talked last week about the necessity of timekeeping as cultures moved from a hunter-gatherer to agrarian lifestyle. Such abilities as marking the passage of the lunar cycles or the heliacal rising of the star Sirius gave cultures the edge needed to dominate in their day. For context, the pyramids on the plains of Giza date from around 2500 B.C., The Ice Man on display in Bolzano Italy dates from 3,300 B.C., and the end of the last Ice Age was around 20,000 to 10,000 years ago, about the time that the calendar was constructed. The site at Warren Field was initially discovered during an aerial survey of the region. Vince Gaffney, professor of Landscape and Archaeology at University of Birmingham in Warren Field, Crathes, Aberdeenshire where the discovery was made. (Credit: The University of Birmingham). The lunar synodic period, or the span of time that it takes for the Moon to return to the same phase (i.e., New-to-New, Full-to-Full, etc) is approximately 29.5 days. Many cultures used a strictly lunar-based calendar composed of 12 synodic months. The Islamic calendar is an example of this sort of timekeeping still in use today. However, a 12 month lunar calendar also falls out of sync with our modern Gregorian calendar by 11 days (12 on leap years) per year. The familiar Gregorian calendar is at the other extreme, a calendar that is strictly solar-based. The Gregorian calendar was introduced in 1582 and is still in use today. This reconciled the 11 minute per year difference between the Julian calendar and the mean solar year, which by the time of Pope Gregory’s reform had already caused the calendar to “drift” by 10 days since the 1st Council of Nicaea 325 AD. Surprisingly, the calendar discovered at Warren Field may be of a third and more complex variety, a luni-solar calendar. This employs the use of intercalary periods, also known as embolismic months to bring the lunar and solar calendar back into sync. The modern Jewish calendar is an example of a luni-solar hybrid, which adds an extra month (known as the 2nd Adar or Adar Sheni) every 2-3 years. This will next occur in March 2014. The Greek astronomer Meton of Athens noted in 5th century B.C. that 235 synodic periods very nearly add up to 19 years, to within a few hours. Today, this period bears his name, and is known as a metonic cycle. The Babylonian astronomers were aware of this as well, and with the discovery at Warren Field, it seems that ancient astronomers in Scotland may have been moving in this direction of advanced understanding as well. It’s interesting to note that the site at Warren Field also predates Stonehenge, the most famous ancient structure in the United Kingdom by about 6,000 years. 10,000 years ago would have also seen the Earth’s rotational north celestial pole pointed near the +3.9th magnitude star Rukbalgethi Shemali (Tau Herculis) in the modern day constellation of Hercules. This is due to the 26,000 year wobble of our planet’s axis known as the precession of the equinoxes. The precession of the north celestial pole over millennia. (Credit: Wikimedia Commons graphic under a Creative Commons Attribution 2.5 Generic license. Author: Tau’olunga). The Full Moon nearest the winter solstice also marks the “Long Nights Moon,” when the Full Moon occupies a space where the Sun resides during the summer months and rides high above the horizon for northern observers all night. The ancients knew of the five degree tilt that our Moon has in relation to the ecliptic and how it can ride exceptionally high in the sky every 18.6 years. We’re currently headed towards a ‘shallow year’ in 2015, where the Moon rides low in relation to the ecliptic. From there, the Moon’s path in the sky will get progressively higher each year, peaking again in 2024.
Who built the Warren Field ruins along the scenic Dee Valley of Scotland? What other surprises are in store as researchers excavate the site? One thing is for certain: the ancients were astute students of the sky. It’s fascinating to realize how much of our own history has yet to be told!